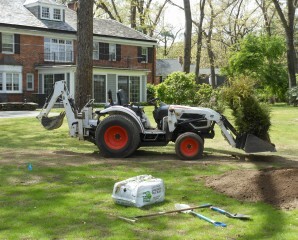 Allow us to help you with any work moving, digging, or hauling materials in your yard, using our turf friendly bobcat. If you need to dig a trench, remove piles of debris, or spread materials, we can help. Unlike most Bobcat services out there, we have turf tires on our machines which allow us to drive on your lawn without ripping your turf and grass up. In addition, our machine is much lighter than most others, therefore, not creating the ruts that most other machines do.